I spent most of my Saturday at an Accordance seminar. A bit of background: I purchased the program about a year and half ago after using BibleWorks and Libronix for a few years (I converted to mac and won’t go back). One of the newer features in Accordance has potential but left me disappointed. When hovering over a word with the cursor, pressing and holding the command key can now bring up a lexicon entry in the instant details window. The problem: There is no scroll feature in this window, so you see as much of an entry as will fit in the window. This makes most of BDAG useless as far as the instant details window goes. For the time being, I’ve set BDAG as a separate window to the right of my main workspace. To toggle from one entry to the next, I must triple click a word. 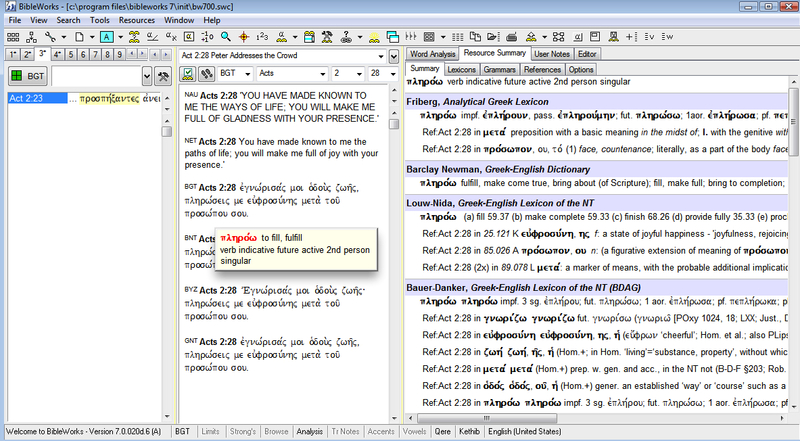 BibleWorks still has the edge here: When I hover over a word, I instantly see a lexicon entry or a plethora of resources regarding the word and or verse reference. It appears that Accordance is working toward a similar capability. Accordance is not without its advantages, though. More on this later in the week! Update: I’ve included the following screenshots from BW (cf. David’s comment and my response). Click to enlarge. Josh, is your intention in getting instant information to quickly get the information you need about a word without moving away from the text (the Accordance philosophy), or to have a more streamlined way to switch to a lexicon and scroll through a long article? In the second instance, you’ve left the realm of instant details and shifted to a detailed examination of a secondary resource. If you want to see most of an article in BDAG instantly, you can change the Instant Details box to a vertical orientation and make it large enough to show all but the longest articles. Adding a scrollbar to the instant details box would require you to hold the shift key in order to freeze the contents of the instant details box so that you can then move the mouse from the word you’re examining to the scroll bar. I’m not sure that’s any easier than just triple-clicking to open BDAG in a separate, scrollable window. David, I appreciate your willingness to dialogue! My intention is to have the best of both worlds (i.e., quickly attain ‘instant’ information with the option of scrolling further if desired). 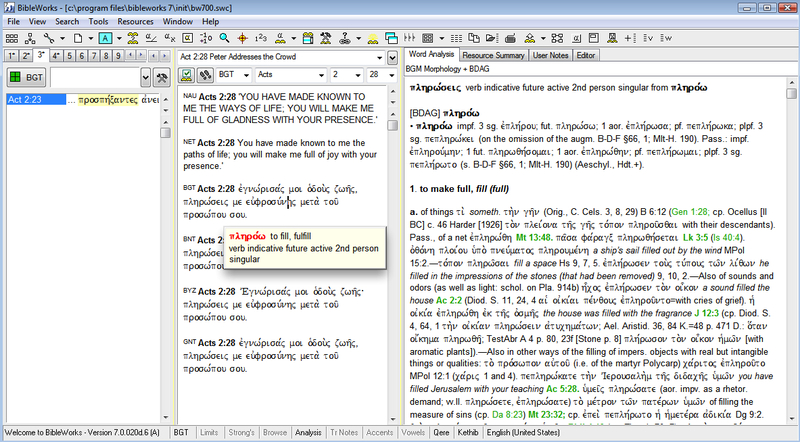 In BibleWorks, as I hover over a Greek word, I have instant parsing information in the right pane with the BDAG entry immediate following. If I desire, I hold ‘shift’ and move to the BDAG entry to scroll (all in the same pane). Further, I can set this right pane to list various resources with the result that hovering over a word will call up relevant grammatical topics (based on gram. tags), lexical entries, and/or relevant Scripture references in these resources. As I move the cursor to another word, the pane instantly displays the new information. Granted, once I choose to scroll, an ‘instant’ has passed, but the whole process is a bit more streamlined in BW. To be clear, I also consider Accordance to be superior in other ways. I hope to make further comparisons in the future to show the differences as I see them. Update: I’ve posted two screenshots which demonstrate what I mean. Click to enlarge.